Whereas John-Mark had an early collapse and then made a comeback, Demas started strong but ended in failure. Demas began well. In Paul’s letter to Philemon, Demas is called a co-worker and in Paul’s letter to the Colossians, Demas sends his greetings. Clearly he was involved with Paul’s ministry in a helpful and supportive role. 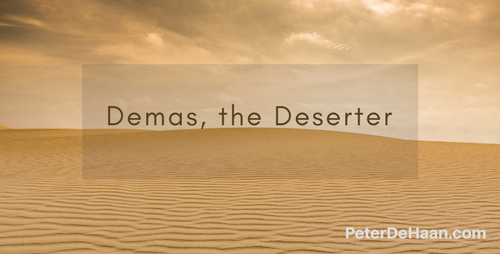 However, in one of Paul’s darker moments, he sadly laments that Demas “loved the world” and “deserted me.” Despite his one-time standing as a co-laborer of Paul, Demas did not finish well. Jesus said, “No one who puts his hand to the plow and looks back is fit for service in the kingdom of God.” Demas first looked back and then he went back, turning his back on Paul, on ministry, and on God. Looking on our past, we see both successes and failures. Today we stand at a crossroads. What will our future look like? Will we turn our back on our faith like Demas or finish well like John-Mark?